Who doesn’t love a fun evening out for dinner and drinks with friends or family? Seems like a no-brainer. But what if some of those folks have food sensitivities? No need to worry, Burtons Grill in Mount Pleasant’s Towne Centre is here for them – and for everyone else, too. It all began in 2005, when Kevin Harron wanted to open a restaurant in the Boston area that blended the best aspects of what he’d observed when eating out and one that served fresh, from-scratch whole foods. His executive chef knew that Harron had celiac disease, so, figuring some of their customers may also have the condition, she drew up a gluten-free menu. From there, the menu expanded to allow for folks with peanut or shellfish allergies as well as those on a vegan or paleo diet. But the choices don’t end there. The chef can usually work with individual customers to ensure that their dietary needs, however specific, can be met. 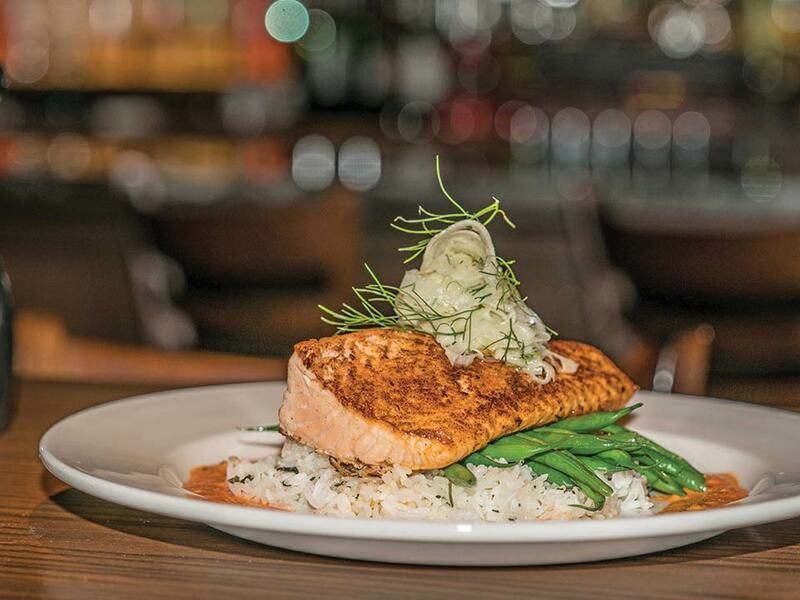 Burtons has expanded to 15 restaurants along the East Coast, from Massachusetts to Florida. Chef Corey Steinke of the Mount Pleasant location operates a test kitchen for the entire company, which means he has been charged with creating new dishes that will be served throughout the chain. Although there is a separate gluten-free menu, about 90 percent of the items on the regular menu also are gluten-free – the soups and most desserts, for example. The entire staff is educated about dietary restrictions, and they all must sign a commitment to work with any allergy concerns. From the moment a customer walks in the door, the hostess asks if anyone in the party has a dietary preference; the server then follows up. Those special orders are written on a purple card and brought to the manager before the food is even prepared. Once it’s ready, the manager brings the food to the table – only certified servers with special training can deliver the order. But Kearley acknowledged that many of Burtons’ customers have no dietary restrictions. Burtons also holds special events to bring the community together. Paws on the Patio, a “yappy hour” benefiting the Charleston Animal Society, is held once a month. Benefit galas for Meals on Wheels and East Cooper Community Outreach have been held, and the restaurant sponsors football and band activities for Wando High School. Burtons’ goal is safety, consistency and quality for every lifestyle. “That’s what our restaurant is all about,” Kearley said. To learn more, visit www.burtonsgrill.com/location/mt-pleasant-sc/ or call 843-606-2590.